This section contains communication tools and resources to support you, and the multi-disciplinary team in the conversations you have with clients around what is important to them at any time. Communicating with a client about their deteriorating health can be difficult. However, while difficult conversations may occur, much of your interactions with clients’ will continue to be about the things that matter to them on a day-to-day basis, and will help you to open up discussions about their end of life wishes. Many of us, including clients will struggle to talk to others about our end of life care wishes. There are tools and resources in this section that we feel may help you in your interactions with clients about what matters to them as their health deteriorates. They include tools to help initiate the more difficult conversations with clients’, and a support and concerns mapping tool that explores with them what they are most concerned about at the time. The shared care section of the toolkit also helps you to consider a more individualised person centred approach to your interactions with clients, and who else can help with some of the more difficult conversations when they arise. A parallel planning approach may also be really useful to help you to ‘hope for the best but plan for the worst’. The majority of conversations with clients with ill health may be part of the normal interactions you have with them. Overtime, conversations may gradually shift away from ‘move on’ and ‘recovery’, and move towards quality of life. Consider how this shift influences how you interact with clients, and the choices you and your team make about the care and support you can offer. For more specific conversations about end of life care, explore with others from the multi-agency team how and when these more difficult conversations might take place, and who might be best to initiate them. Acknowledge that you have a lot to offer as you may know your clients better than anyone else. The enabling communication pre planner factsheet might help. This factsheet provides a summary of things to support the conversations you have with clients. As best you can, try to keep conversations true to the relationship you have with the client. While some aspects of a conversation with a client may be hard, you don’t have to change the way you ordinarily are with them. Sometimes humour or your typical banter is what’s needed. Sometimes, just being yourself is perhaps the most important quality you can bring to enable clients to open up about what matters to them. It’s also ok to tell a client how you might be feeling, or that you don’t have the answer, but may know someone who does. We wont always get it right. You might miss opportunities and wish you had been able to speak earlier. This is part of life and you do not need to feel guilty. But be realistic. Do not make promises that cannot be delivered. Respect a client’s wish not to discuss or address certain issues. Clients may only want to talk about certain things at certain times. This may be a coping strategy or defence mechanism to manage their fears or concerns. While clients may struggle to change or talk about particular aspects of their lives (such as abstaining from alcohol), it does not mean they cant maintain hope or consider possibilities for change. A parallel planning approach may be helpful. Respecting clients and the choices they make. Actively listening – understanding the meaning behind the words. Demonstrating an ability to feel and show empathy, positive regard, respect, kindness and understanding to what clients really need. Acknowledging our own feelings (where appropriate) when talking about uncertainty, death and dying. Not always needing to make things ok, or have the answers. Using language that clients understand; avoiding jargon. Prioritising information – not giving too much information, only what is needed at the time. Being aware of non-verbal communication – both yours and the client’s. Before initiating conversations, it might be helpful at times to stop and think of what it is you, (or the multi-agency team) want to communicate about, and why now, particularly for the more difficult conversations about clients’ end of life wishes and concerns. What has prompted the need to have this particular conversation at this moment in time (e.g. multiple hospital admissions, notable changes in their health, or a marked withdrawal from social activities)? If it’s comfortable or appropriate, let the client know at the beginning something of what you hope to get from the conversation, in the same way as they might want you to know what they hope to get from it. You may want to write some thoughts down in advance. It may not take you long, but gathering your thoughts and writing them down in advance will help you to gain some perspective, and inform how you would like to proceed. That the client feels listened to and respected. That they feel comfortable letting you know what really matters to them. To explore the issues and concerns at hand (e.g. notable changes in health; place of care issues). That they feel encouraged to work toward their goals and aspirations. That they are happy and willing to let other services support them and the project. To find out how well they are coping, and/or what their future concerns are, should their health deteriorate. That they see you are trying your best to help. Things client’s might hope for? There are many things we may wish to explore with clients at different times and stages of their illness. Some are outlined below, but there might be other things that resonate with you or your client that you wish to raise. The initiating difficult conversations activity sheet can help when thinking about the more difficult conversations you or others are likely to have with clients. This could help you think about what you want to talk about, and what you both might hope to get from the conversation. Use the questions to consider tool to give you some ideas about the kind of questions you may want to discuss with clients. This could be helpful to look at while planning conversations with a client or before using the support and concerns mapping tool. Never feel you need to get everything you want to say covered in one conversation. Conversations are likely to be part of a process. It’s important to remember that you are not there to fix or to change things, but rather to help the client explore how their quality of life might be improved. The support and concerns mapping tool centres on a tool known as node link mapping (NLM), which is based on the same cognitive behavioural principles as motivational interviewing. It can be a useful tool for exploring aspects of a client’s life and the concerns they may be holding at the time, particularly if their health is poorly. Conversations can be held over a number of sessions, and at a pace the client feels comfortable with. The tool also enables clients to consider the kind of goals and aspirations they would like to pursue that are realistic and achievable to them at the time. When the maps are completed they can be kept as a record for the client and keyworker, and used as a reference in any future multidisciplinary meetings or appointments. Click here for the support and mapping tool. This video considers ways we can relate to some of the difficulties clients experience. There is no right or wrong time to have conversations with clients. Timing will depend on many different factors, including the kind of conversation you or the multi-agency team are wanting to have, how clients are feeling at the time, or the choices they make as to whether they want to engage or not. Conversations do not have to happen all in one go either. It’s perfectly ok for you (or others from the multi-agency team) and the client to begin a conversation when the time is right, and return again when appropriate. Remember, a client does not need to be identified as palliative before conversations about their health begin. By having exploratory conversations early on, opportunities can arise to anticipate current and future supports, including end of life care if needed. Sometimes conversations arise naturally while someone is well, with no urgent need to plan ahead. The ideal would be to seize these opportunities to learn about the client’s wishes when there is no pressure to do so. This may change over time, but if you have spoken about it in the past it might be easier to return to in the future. Throwaway comments: People can make comments such as ‘Will you come to my funeral?’ or ‘I might not be here by then’. It’s good to tune in to these comments. They may provide a way of opening up conversations about the client’s own wishes, fears or concerns. When someone dies: Conversations often arise naturally following the death of a friend, loved one or acquaintance. Speaking with clients, either individually or in a group, about how to respond to another client’s death can lead to questions about their own wishes, should their health deteriorate. Hospital admissions, discharge meetings, multi-agency meetings, or notable changes in symptoms provide opportunities to explore clients’ needs and what really matters to them. Ensure other members of the multi-agency team are aware of your concerns, and consider whether a multi-agency meeting is needed. Where difficult conversations with clients are anticipated or required, who in the multi-agency team is best placed to have them? Try to use open-ended questions that cannot be answered by a simple ‘yes’ or ‘no’ – (see below for some examples). The questions to consider tool may also help you. Actively listen – bring your attention fully to what a client is saying. Make time – When opening up conversations with a client, find a quiet environment and try to make sure you are not likely to be called away. Once you ask a question, you may not know how a client will respond or how long you may need to spend with them. Be yourself – Remember, while some aspects of a conversation may be hard, you don’t have to change the way you ordinarily are with them. Being ourselves is one of the most important qualities we bring that enables clients to open up about what matters to them. This video explores some techniques that may help you when opening up conversations with clients. Open-ended questions have an inviting quality, and encourage open and honest communication. This could be about what really matters to you and the client in that moment, and what both of you are hoping to get from the conversation. It also allows you the opportunity to show how respectful and interested you are in what really matters to them, and in turn may encourage them to be more open about sharing their thoughts and feelings. You can find a more comprehensive list of questions in the questions to consider tool. Active listening is fully concentrating on what is being said rather than just passively ‘hearing’ the message of the speaker. As well as giving full attention to the speaker, it is important that the ‘active listener’ is also ‘seen’ to be listening. Interest can be conveyed to the speaker by using both verbal and non-verbal messages such as maintaining eye contact, nodding your head and smiling, agreeing by saying ‘Yes’ or simply ‘Mmm hmm’ to encourage them to continue. Active listening is also about patience – pauses and short periods of silence should be accepted. Listeners should not be tempted to jump in with questions or comments every time there are a few seconds of silence. For more information about active listening, the SkillsYouNeed website has some useful advice. 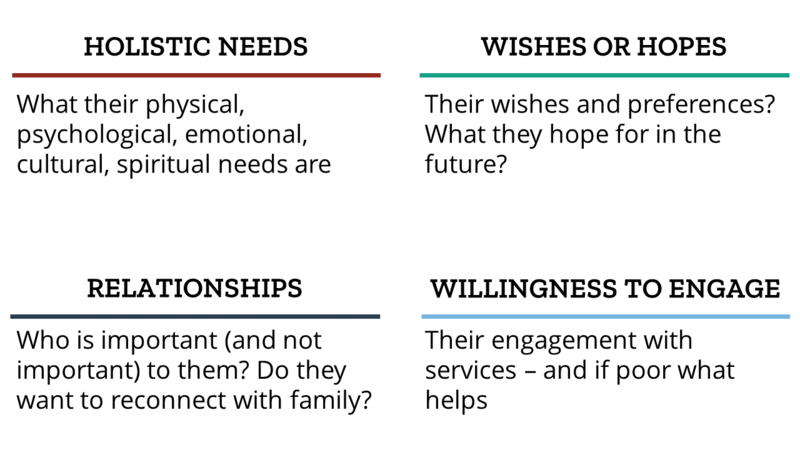 This video explores the different ways conversations can be initiated about clients wishes and concerns. It’s important to consider in advance the difficulties that clients may have in engaging with you or members of the multi-agency team about their deteriorating health. This may include a client’s ambivalence about their poor health, or the difficulties they have in expressing strong emotions to others. We also need to consider our own fears and concerns, that for some of us may lead us to avoiding certain conversations altogether. Some of what you wish to discuss with clients is likely to feel very new, and outside the comfort zone of what you know and generally talk to clients about (i.e. recovery, and moving toward independent living). It may be helpful therefore to consider at some point what, (if any) difficulties arise for you when thinking about a client’s palliative and end of life care, and how these difficulties may impact on your interactions with them. 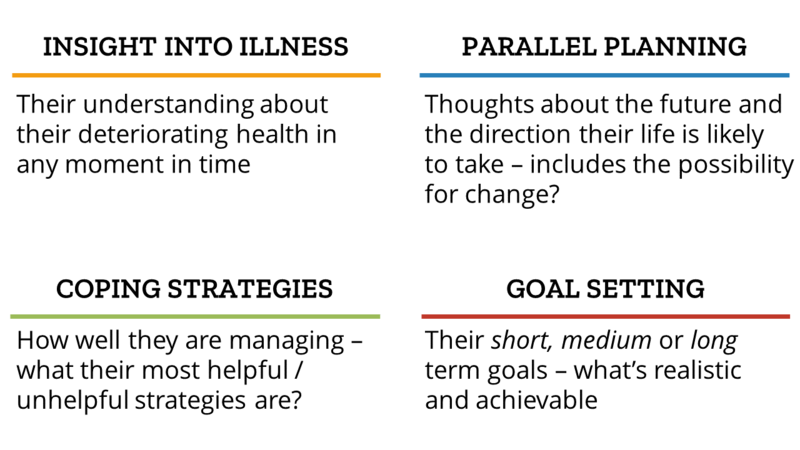 The pre-planner fact sheet can give you some useful prompts to consider when thinking about the difficulties you may experience, and when planning conversations with clients’. This video considers ways in which to manage our own difficulties should they arise in our conversations with clients. It’s important to consider in advance the difficulties that may get in the way of clients engaging with you or members of the multi-agency team, and the potential reactions that arise from these difficulties. It is also important how the multi-agency team communicate with each other about the difficulties a client might be experiencing. 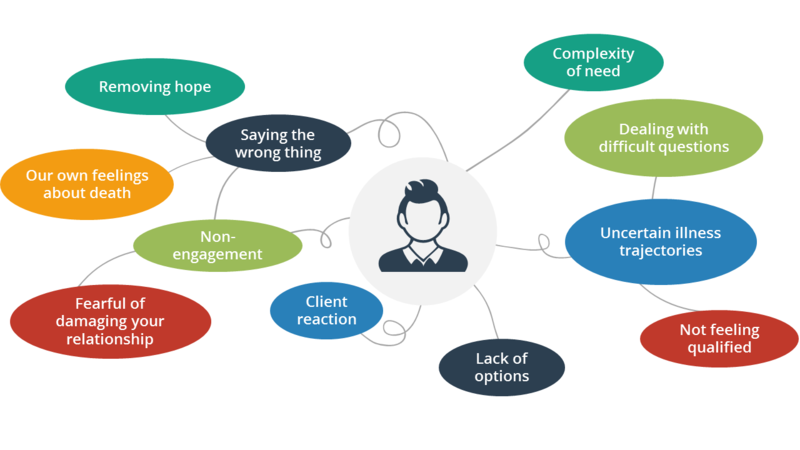 The earlier these difficulties are considered within a client’s illness trajectory, the more likely their needs and wishes will be heard and met in a timely way. Living with uncertainty or ambivalence around their diagnosis or prognosis. Use of alcohol or illicit drugs to block out these emotions. Little or no engagement with services – mistrust, not feeling respected or listened to, feeling judged. Difficult mental or psychological issues – e.g. PTSD or complex trauma. Extreme vulnerability – use of aggressive, manipulative or passive behaviours. This video might be helpful for thinking about different ways to talk to clients about issues that might be difficult to talk about. Before opening a potentially difficult conversation with a client, consider how they generally respond or react to difficult situations. Do they have a tendency to become irritated, angry, or want to avoid people and services? Anticipating in advance how a client may respond or react will help you to consider alternative approaches that may prove more beneficial. Acknowledge and respect those times when clients do not wish to engage, or only talk about what’s acceptable to them. Reluctance to discuss certain things may be a coping strategy or defence mechanism to manage their fears or concerns. Our role is to help clients to explore how their quality of life can be improved, while at the same time accepting the limitations of what we’re able to achieve. Consider any difficulties that might arise for you. This can help you anticipate your own responses, and those of the client. Think about who or what else can help. For example, talking to others who know the client well. There may be benefits to involving others in some conversations. 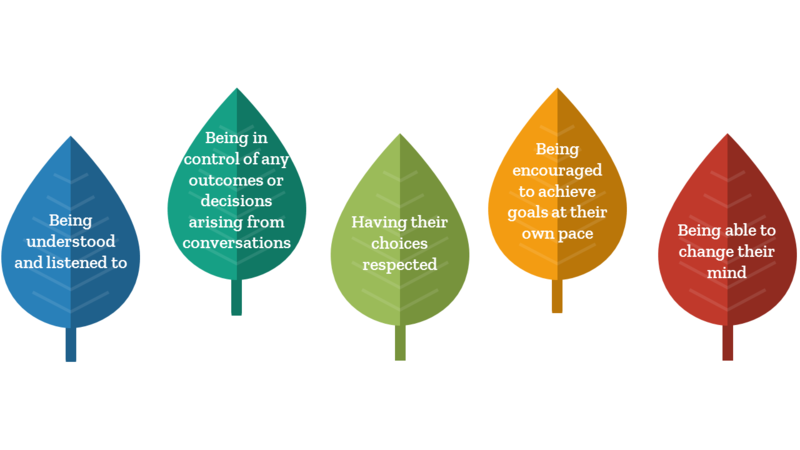 Use the Eco-map when thinking about how those significant to the client might help with any difficulties that may arise, by offering practical or emotional support. Sharon has been 30-year-old Darren’s keyworker since he moved into the project two years ago. They developed a strong and trusting relationship, and often chat over cigarettes outside the project. Sharon was with Darren in the hospital when he was informed by doctors he had decompensated end stage liver disease. In the weeks following his diagnosis, Darren became quite subdued. He began drinking in his room away from other residents, and avoiding Sharon and other staff members. While having a cigarette outside the project with Sharon, Darren mentioned he probably wouldn’t make it to their key-working session as he was ‘on his way out’. Sharon was shocked by this, and asked him what he meant. Darren said he knew if he continued drinking, his liver couldn’t take it anymore. He explained he had been thinking a lot about it and felt at peace with what the future held. He was sure he did not want to reduce his drinking or go to detox again, something he had attempted twice before, each time leaving after a few days. He wanted to remain at the project, which he considers home, and live his life the way he chooses to. Sharon felt she wanted to encourage Darren to reconsider detox and rehab, but soon realized this was more about her own aspirations for his future, and a fear about him dying, rather than what he wanted. She knew that the best way forward was to respect his right to make his own decisions, and to work with him around what mattered to him in terms of current and future support needs. Over the coming months, Darren’s hospital admissions became more frequent. Sharon asked Darren if she could arrange a case review to consider his future care at the project, as she knew the project would need support from other professionals. From this initial case review it was agreed that the community palliative care team would be involved, and that more regular reviews would be held to monitor any changes in his health and make sure that his wishes were considered in his care. Further discussions gave Darren the chance to let project staff know who he wanted to be there if he became more unwell. Along with a few names of staff and clients at the project whom he trusted, Darren mentioned that he thought his family should probably know what was happening, though he hadn’t spoken to them for over 10 years. Sharon and Darren agreed they would make contact with his mother together. As Sharon was aware of Darren’s frequent hospital admissions and poor prognosis, his throwaway comments about being ‘on the way out’ provided Sharon with the opportunity to explore what his insight was into his illness, and what he wanted for the future. Acknowledging our fears about the possibility of death for clients is so important. Giving space to reflect on where we sit with death and dying can help us when exploring what matters to clients in any moment in time, and respect their wishes even when they are not what we would hope for ourselves. This activity worksheet could help in planning what you may like to discuss with clients, particularly with the more difficult conversations. Involving the multi-agency team enables staff and clients to feel supported, and ensures wishes and concerns can be incorporated into all care-planning going forward. Talking about what matters to Darren, particularly as his health deteriorates further, allowed him to plan ahead. Identifying those significant to clients (see the Ecomap), and what they would like from those providing care, are at the heart of any care plan. It is important to remember that you and your team are not on your own when it comes to having conversations with a client. There are others you can turn to for support and information. It may be that different members of the team have different relationships with clients. Consider what you would like support with, and approach those within the multi-agency team best placed to help you discuss these issues with clients. This could include information about availability of specific palliative and end of life care support. Case reviews, multi-agency meetings and hospital discharge meetings are also ideal settings for everyone involved to share ideas about how to work with or around any difficulties. Think ahead as to whether certain conversations are best initiated by others within the multi-agency team. The ‘who can support you? tool’ is helpful here. Consider how advance care planning (ACP) might benefit a client and which members of the multi-agency team can help. The responsibility for breaking bad news to a client about their prognosis, or about other matters lies with the client’s healthcare team. A client may be happy for you to attend medical appointments, which gives you the opportunity to hear the information that is given. The benefit in attending such meetings is that you will then know what they know. This shared understanding is likely to be helpful in future conversations with them. However, a client may choose to listen only to what they want to hear and this ought to be respected. In the event that you have information about a client’s prognosis before they do, try to ensure their GP, consultant or hospital medical team arranges a meeting to inform the client as soon as possible. Knowing their prognosis before they do can place you in a compromised situation and if the client were to find out, they may resent it. It’s also important to consider your own feelings around hearing bad news, and how it might impact you. The self care toolkit contains some resources to help you identity and manage stress at work. These tools can be used at any time to give structure to conversations with clients that enable them to live well and get the best out of life. There are tools for clients and you to explore together what’s most important to them, including future hopes and aspirations. They can be particularly useful for talking to clients for whom there is a lot of uncertainty about their illness or prognosis. Node link mapping- Manual for healthcare practitioners on building and carrying out an effective plan for recovery from substance addiction.